When using Experience components such as the Action launcher or Triggers, data mapping is done automatically by Bizagi. In sophisticated scenarios of a data model where there are no direct relationships, but an Xpath navigation that is more than one entity away, you may choose to influence the mapping logic by explicitly including Hints. Hints will help Bizagi to map information that require one or more jumps when navigating through the XPaths. Define Hints for an entity editing its Advanced properties. In the following example, we will use the Car Insurance application. The business case is as follows: the Client stakeholder has an Action that launches a processes to create a new policy. 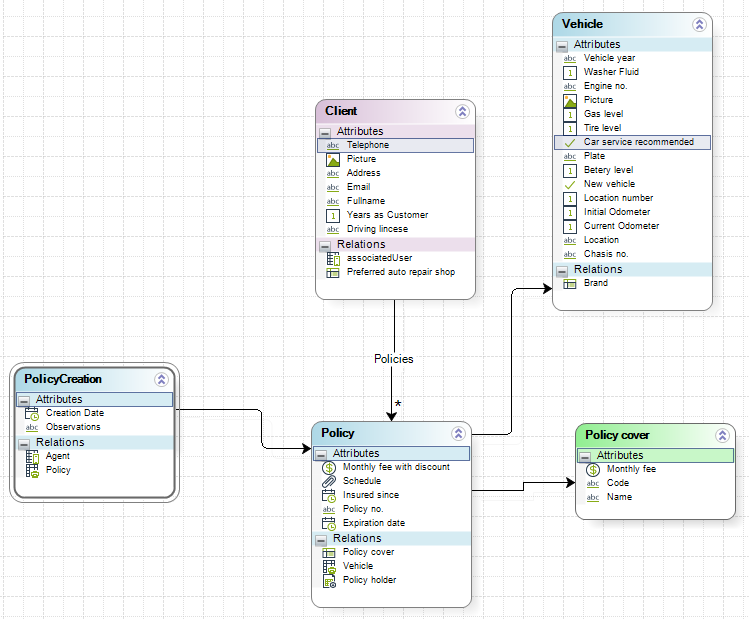 The Action button creates a new instance of the Policy Creation process using the following Data Model. The Process Entity is PolicyCreation. When the process starts we need to be able to automatically map the customer we have selected to create that new policy. Notice however that navigating to the Client requires one related attribute jump from policy, there is no direct connection to the Client entity from the Process Entity. In order to create the Policy for the chosen client, the Client has to be injected. Nevertheless, Bizagi maps records automatically when the related attributes are in the Process Entity. This is not the case: there is no direct relationship between the Process Entity PolicyCreation and the Client stakeholder; therefore, it is necessary to create a Hint in the PolicyCreation entity in order to map the Client selected. To define a Hint, open your project with Bizagi Studio and go to the Expert view. 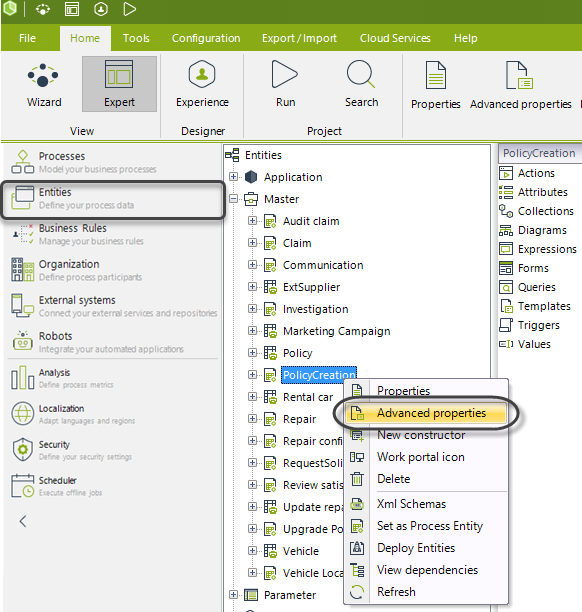 In the Entities module, locate your Process Entity and right-click it to select Advanced properties. Recall that Hints can only be created for Process Entities. In this case, select the PolicyCreation Entity. Select the Mapping tab. By default this tab displays all the direct relationships of the entity, either collections or single entities. Click the Add Hint button. Build the XPath required to locate the entity. In our example, the Xpath generated is NewPolicy.Client. Click OK to add the Hint. The new Hint will be listed. 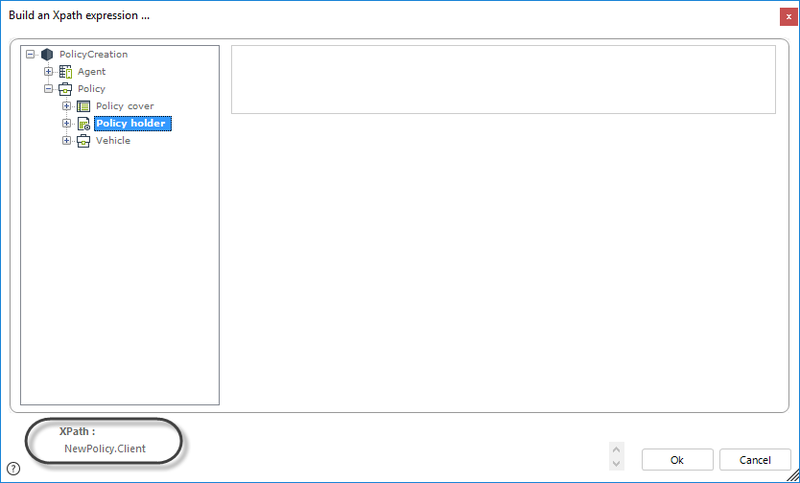 Only the hints created manually will have the Edit Hint and Remove Hint buttons in order to change or remove the built Xpath. Furthermore, the Automapped check cannot be unmarked.